The Challenge team leader guidebooks contain the curriculum. We have 3 age specific curriculum: 5th/6th grade, 7th/8th grade, and high school. We offer a three year series (Series 1, Series 2, Series 3) for each age group so that it is never repetitive. Challenge offers 30 books in the curriculum series with over 180 weekly activities and 36 service projects. We offer 3 books each year, for each grade level, plus two special guidebooks for Advent & Lent Guidebook and Virtue & Saint Guidebook. Each book contains 5-8 weeks of activities and 1-2 service projects. Every year we update the books and series with new videos, activities, and content so there is new and relevant content for the teens. In Challenge, our curriculum is based off the questions teens have about God, their faith, the world, and themselves. The theme for each week is a question. The weekly activity in the team leader guidebooks gives the team leader a path to lead the team down and discover the answer to the question of the week. First, they turn to the YOUCAT to find a solid catechetical answer to the question. Then the team leader goes through the 6 parts of the Challenge weekly meeting where they gain a better understanding of the question of the week. Each weekly meeting has at least 1 game, activity, or experience; relevant video clips; a gospel reflection to find how Jesus answered the question, and at least 1 saint or story of someone who discovered the answer in their own life. The games are not listed on the charts. The curriculum and guide for each weekly activity is in the team leader guidebooks but we also have a CD or USB drive and online resource center with hundreds of printouts and additional material that to help the team leader lead the meeting. On the curriculum maps, you will see that Challenge has the same theme or question each week as Conquest, but sometimes the saints, games, and activities differ to work better with girls and boys. The curriculum charts for the year 1 curriculum charts can be found on the following pages. The year 2 curriculum charts are similar but with different questions, saints, and gospels. We have a 2 year cycle so that it does not get repetitive for the teens. We also update and add new videos, activities, and material each year to the curriculum. The Challenge 5th/6th grade Series 1 curriculum set includes 4 books (plus the Virtue and Saint Guidebook). The books in this series feature the service projects: All Saints Bash, Warm Wishers, May Crowning, Rally Round the Wreath and Christ’s Passion Mission. Books 1-3 each have 5 weeks of curriculum, the Advent / Lent book has 8 weeks, and the Virtue and Saint book contains 10 weeks. All books have lots of material downloads available from the team leader online resource center. The Challenge 5th/6th grade Series 2 curriculum set includes 4 books (plus the Virtue and Saint Guidebook). The books in this series feature the service projects: Blessing Bags, Light House, Divine Valentine, Christmas Cookie Caroling, and Challenge Missions. The Challenge 5th/6th grade Series 3 curriculum set includes 4 books (plus the Virtue and Saint Guidebook). The books in this series feature the service projects: Grandma and Grandpa Grins, Charity Challenge, Baskets of Joy, Bethlehem in your Backyard, and Spread the Word! The Challenge 7th/8th grade Series 1 curriculum set includes 4 books (plus the Virtue and Saint Guidebook). The books in this series feature the service projects: The Pie Project, Chari-tea, Daddy Daughter Day, Rally Round the Wreath and Christ’s Passion Mission. Books 1-3 each have 5 weeks of curriculum, the Advent / Lent book has 8 weeks, and the Virtue and Saint book contains 10 weeks. All books have lots of material downloads available from the team leader online resource center. The Challenge 7th/8th grade Series 2 curriculum set includes 4 books (plus the Virtue and Saint Guidebook). The books in this series feature the service projects: Grow Goodness, Fr’s Day Dinner, Life Saver, Christmas Cookie Caroling, and Challenge Missions. The Challenge 7th/8th grade Series 3 curriculum set includes 4 books (plus the Virtue and Saint Guidebook). The books in this series feature the service projects: Mommy Missions, Soup for the Soul, Little Acts of Love, Bethlehem in your Backyard, and Spread the Word! The Challenge High School Series 1 curriculum set includes 4 books (plus the Virtue and Saint Guidebook). The books in this series feature the service projects: Hot Dogs for the Homeless, Links of Lights, Pro-Life Patrol, Rally Round the Wreath, and Christ’s Passion Mission. Books 1-3 each have 5 weeks of curriculum, the Advent / Lent book has 8 weeks, and the Virtue and Saint book contains 10 weeks. All books have lots of material downloads available from the team leader online resource center. The Challenge High School Series 2 curriculum set includes 4 books (plus the Virtue and Saint Guidebook). The books in this series feature the service projects: Mom & Me Tea, Walk with Christ, Pilgrim Queen, Christmas Cookie Caroling, and Challenge Missions. 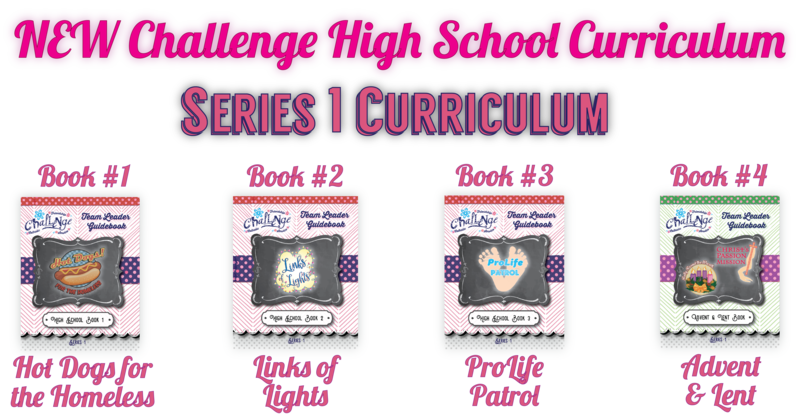 The Challenge High School Series 3 curriculum set includes 4 books (plus the Virtue and Saint Guidebook). The books in this series feature the service projects: Dreams Come True, Reel to Real, Hospital Helpers, Bethlehem in your Backyard, and Spread the Word! 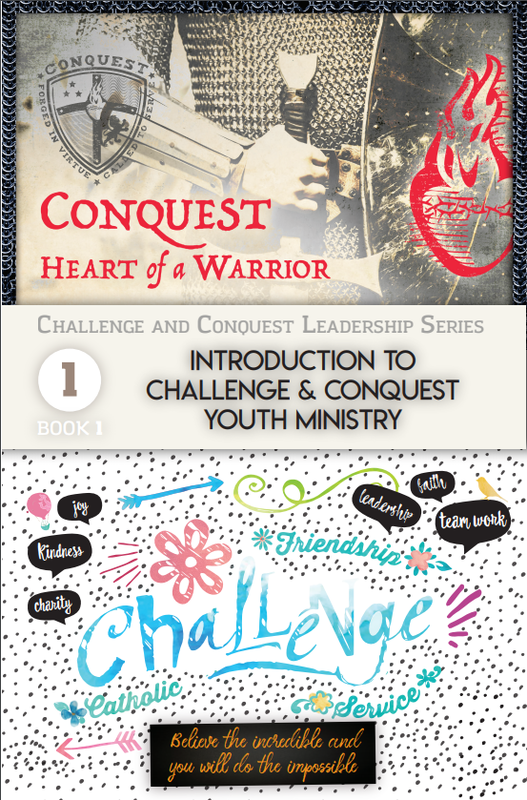 Challenge and Conquest have a virtue centered curriculum, encouraging the kids to put their faith into action each week. We take this 1 step further by encouraging the boys and girls to live a virtue of the month and get to know the life of a saint each month. 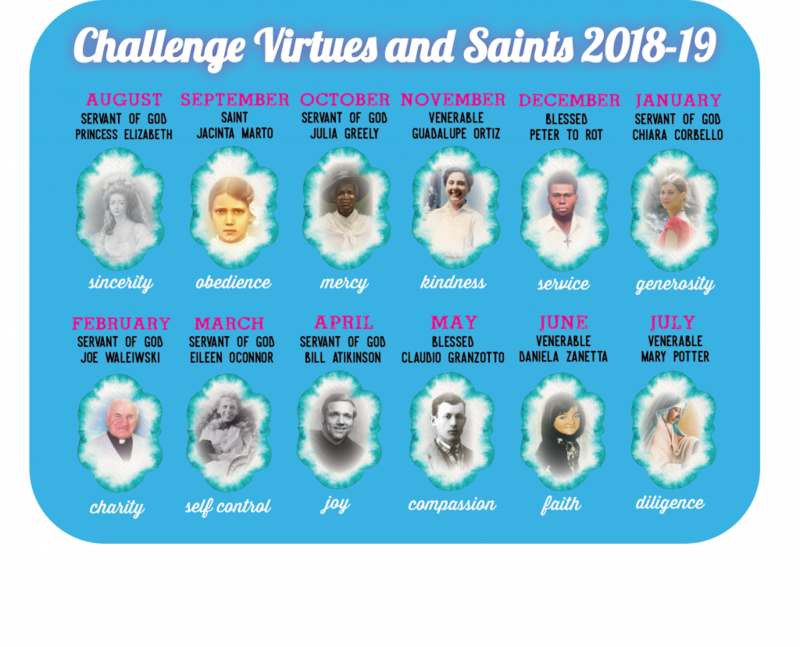 Our saints and virtues of the month can be found in the Conquest and Challenge calendars which are included in all of our member, team leader, and club leader kits. Please fill out the form below to download the stories. Only registered parishes, schools and individuals with an active annual memberships are legally permitted to use the Challenge name, brand, logos, methodology and materials. Any unauthorized use violates federal copyright laws. The Annual membership is to be renewed each year.